Now that we’ve talked about wide vs narrow and MOBI vs EPUB, I’d like to turn our attention to retailers and distribution channels. You probably noticed at the end of Part II that I’d planned to cover the actual creation of MOBI and EPUB files in Part III, whether through an application or as an online service. Two posts in a row on file types? What was I thinking? 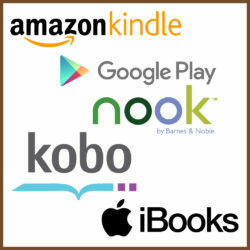 The big ebook retailer platforms are Amazon Kindle, Apple iBooks, B&N Nook, Kobo, and Google Play. Amazon is massively dominant, and there are a host of smaller retailers in play beyond the ones I mentioned. The specific marketshare varies by country. Here’s one recent overview. There are three basic approaches to going wide. 1) Upload individually to all retailers you wish to use. 2) Use an distributor, a company that you upload to and they upload to all the other retailers. 3) Split the difference and take a hybrid approach. Let’s run through each of them. This approach is orders of magnitude harder than the other two options. Each retailer requires an account with all the attendant information to list your books and to pay you. Don’t dismiss this effort… it is long, tedious work. After you’re done, you’ll then have to ensure any future changes are propagated to each channel individually (e.g. change in price, or cover, or blurb, etc.). On top of that, right now you can’t get an account with Google Play. The advantage of this approach is it allows you to ensure your book listings are optimized for each retailer, and it will generally maximize your revenue. There are two classic intermediaries, Smashwords and Draft2Digital, and a recent addition, Pronoun. The first two options can publish to a ton of retailers, but generally don’t publish to Amazon (for instance, here’s Smashwords distribution statement). Using Smashwords or D2D is radically easier than the first option. All the information is entered once, and then propagated out to all the retailers you select. In return, the distributor takes a percentage of your revenue from the retailers. Pronoun is a newer option and now owned by Macmillan. Right now, Pronoun only distributes to the largest retailers, but they also distribute to Amazon, and they have no current fees. I’ll discuss these distributors more in my next post. With the hybrid approach, you publish directly to Amazon using KDP, and publish to everyone else using a distributor. If one of the sales channels becomes a massive source of revenue, then consider pulling it out of the distributor and publishing it directly to maximize your revenue. I highly recommend this hybrid approach in general, though there are many possible exceptions. In the general case, however, I recommend publishing to Amazon via the Amazon KDP platform, and using a distributor for everyone else. In my next post I’ll go over some specifics on the distributors, focusing in on the strengths and weaknesses of Pronoun, the oddball of the lot.